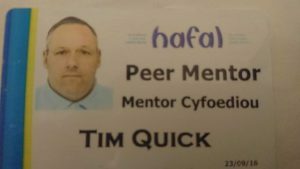 Tim Quick, a Peer Mentor with Cyfle Cymru, has come a long way in ten years. 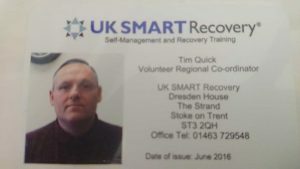 From dealing with his own mental ill health and subsequent substance abuse, Tim is now working full-time, helping people overcome the very same issues he has. 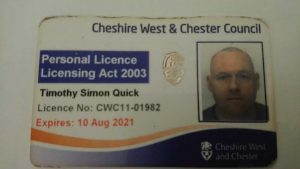 Tim was once a hotel manager, but was dealing with mental health and substance misuse problems. 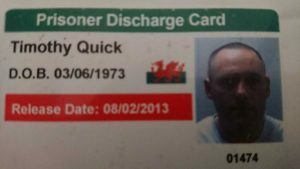 Throughout his life, Tim had been in and out of prison but then realised it was time for a change. He sought help and completed a treatment plan whilst doing some fantastic volunteering work, and now Tim is in full-time employment with Cyfle Cymru and is doing extremely well. “Having had mental health issues from a young age, I learnt to cope with my mental health via substance abuse. The alcohol and pills seemed to keep the feelings of hate, worry and suicide down. “Sometimes I had periods of good wellbeing, but there were other times where I would lack the skills to cope with stress, and my mental health would deteriorate quickly. “This is me in what was my safe haven. “Having been in and out of prison most of my adult life, this was one of my last sentences. Prison for me was an escape from society. I had the security of somewhere to live and eat, and didn’t have to deal with other people. I used to isolate myself from the world, exercise my mind through books and working out at the gym. “This is me, feeling free from the shackles of stress. By the time this photo had been taken, I had been through and completed, for the first time ever, any kind of treatment plan. “I had been volunteering with Cyfle Cymru from day one and became the first person to come through the project and become a Peer Mentor. “Nearly two-and-a-half years later, thanks to the support I received, I am recovered and in full-time employment, part-time education and still doing some volunteering. We’d like to congratulate Tim on the brilliant progress he’s made in the last decade and we’re delighted to have him as part of the Cyfle Cymru staff team.